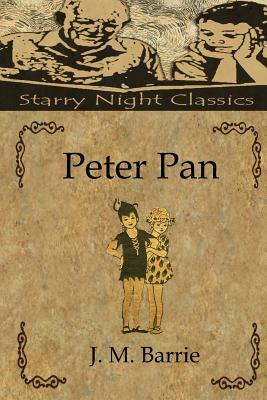 The classic exploits of Peter Pan, the Neverland resident, whose everlasting youth and adventure has delighted readers for more than one hundred years. Join us for some of Peter's most memorable adventures with Captain Hook, Wendy, John, Michael and the Lost Boys. Readers will enjoy this original volume immensely. Sir James Matthew Barrie was born on May 9, 1860 in Kirriemuir, Scotland. Educated in Scotland, he eventually moved to London, England, where he had a career as a playwright and novelist, creating more than five dozen works. The character of Peter Pan first appeared in 1902, in "The Little White Bird," and again in 1904, in the play, "The Boy Who Wouldn't Grow Up." Finally, in 1911, Barrie wrote the novel "Peter and Wendy." The name Wendy was created specifically for the story, inspired by a young girl named Margaret Henley, who called Barrie "Friendy," but had a speech difficulty, which made it sound like "Fwendy." In April 1929, Barrie gave the rights to the Peter Pan works to the Great Ormond Street Children's Hospital. His last play was written in 1936. Barrie's friends included Robert Louis Stevenson, Arthur Conan Doyle, A. A. Milne, Sir Walter Raleigh, George Bernard Shaw and H. G. Wells. He died of pneumonia on June 19, 1937 and is buried in Scotland next to his parents.